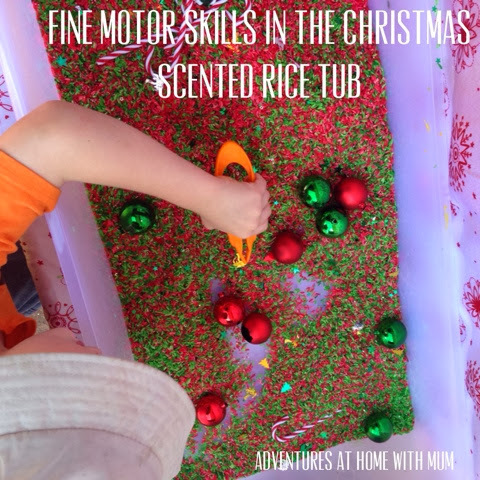 Our first Christmas Spirit Play experience this season is a Peppermint Scented Red & Green Rice Tactile tub. 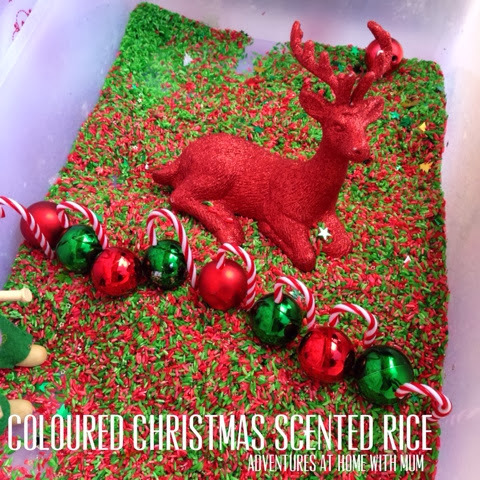 I dyed a heap of rice with red & green colouring, then as it dried I added Peppermint essence to give it a christmassy smell. It was divine! Once ready I put in a bag of Christmas themed sequins and glitter, plastic candy canes, some Christmas decorations and Christmas tree baubles. Dimples contrasted the red and the green baubles with the red and green rice. I had taken the ends off the bauble and Dimples started putting grains of rice into them. The hole was tiny so this was a great fine motor task for him & to add to the sensory delight, he found that if he shook them they made a musical ding. 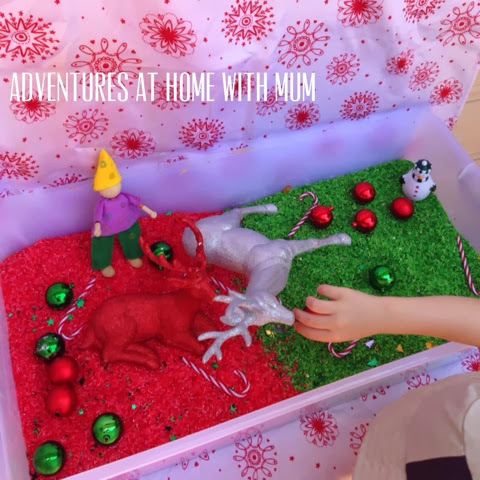 Eventually he mixed the colours around, enjoyed some pretend play with the reindeer & elf figures, they made tracks, the elf rode the reindeer around and then they tripped over the decorations and got buried. Dimples commented on how yummy the rice smelt. 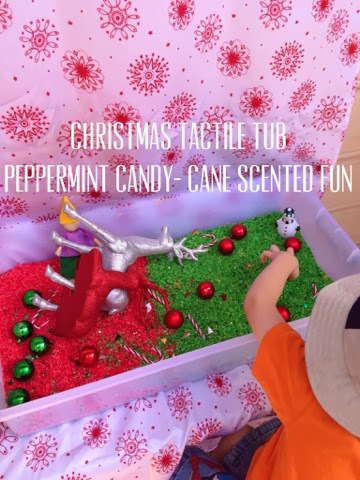 There was a stray bauble that ended up smashed on the ground, they are plastic so I think Dimples had something to do with it 'smashing' he used this cue and filled the open bauble up to plant candy canes in it. 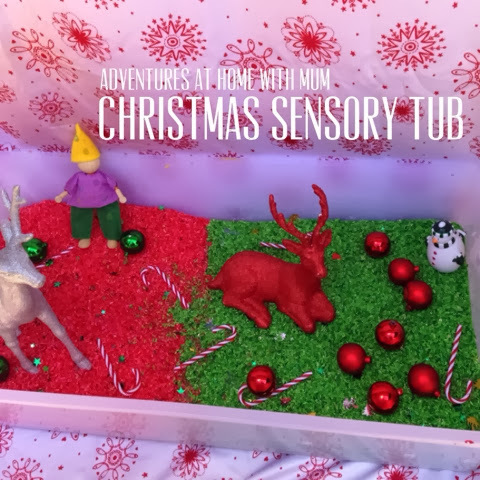 The tactile tub was a great sensory experience with the contrasting colours that were visually appealing, the sound of the rice pouring and flicking around, along with the scent but it also provided a goo imaginary Christmas scene. After a while Dimples decided to fence in the reindeer so they could escape. 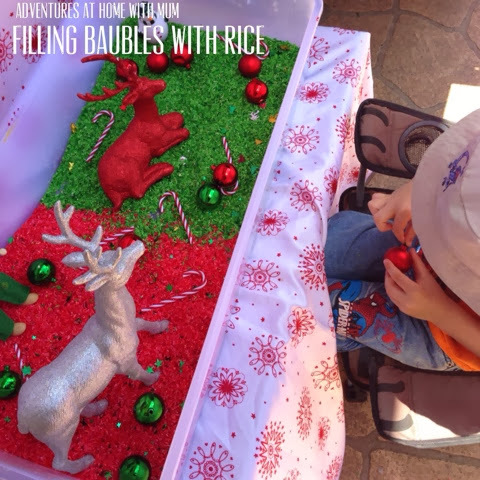 He very carefully piled up rice and made a rail out of baubles and plastic candy canes. After a while when he started to lack interest I added some more elements. Funnels and large plastic kids tweezers. 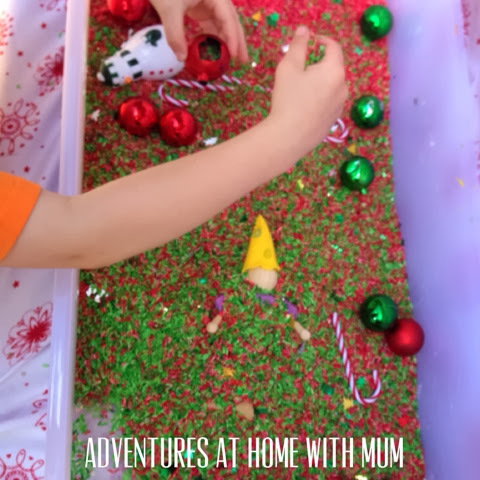 He did his usually pouring and experimented with the different funnels then very cleverly used the large tweezers to grab the large Christmas sequins. More fine motor practice and sorting through the rice to find the same sort of sequins. this was time consuming and required lots of focused attention. Have you played with scented Rice before? What Scent have you used? Here are some of our previous posts using rice. They're always a hit! I love the idea of adding the peppermint..Divine! 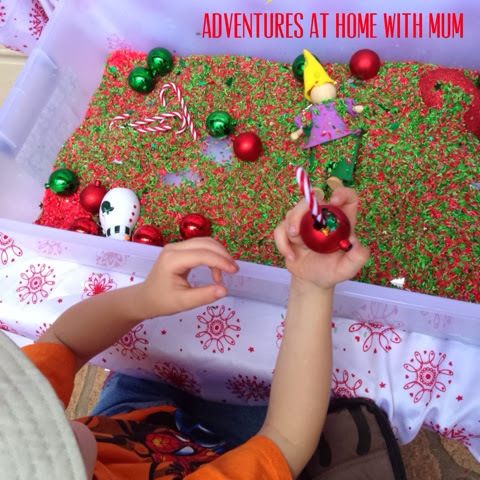 And such glorious Christmas colours and sensory fun!! So much fun! How christmassy does that red and green rice look!!! Love it! I keep forgetting how much cammy loves to play with rice. Peppermint scented would be heavenly to play with. Gorgeous colours! This really looks like so much fun. That looks like awesome fun! Kids just love shiny, sparkly Christmas things don't they? WOW! That looks so beautiful and I bet it smells amazing too. Thanks for the idea. We'd love a Christmas rice tub here!